On Christmas Eve, I look for something easy and ethnic. This recipe is delightfully different, satisfying and easy. You will be excited to go after the leftovers. In a large family skillet with lid, heat oil on medium heat. Add onion, green onion and garlic; sauté until soft. Add sausage and Creole seasoning. 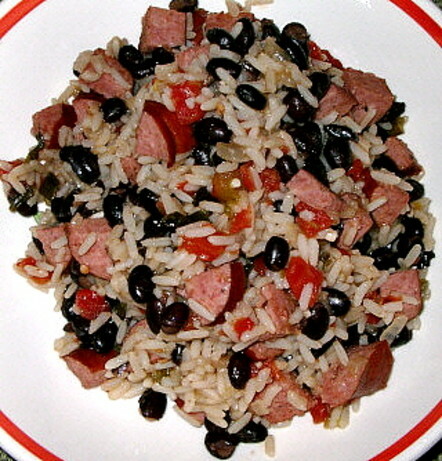 Once sausage is slightly brown, add tomatoes, green chilis, and black beans. Pour chicken broth into measuring cup and add water to measure 2 cups. Add 1-cup rice and broth, water mixture to skillet. Bring to a boil, cover and reduce heat to a simmer. Cook until rice is cooked through and mixture is thickened slightly.